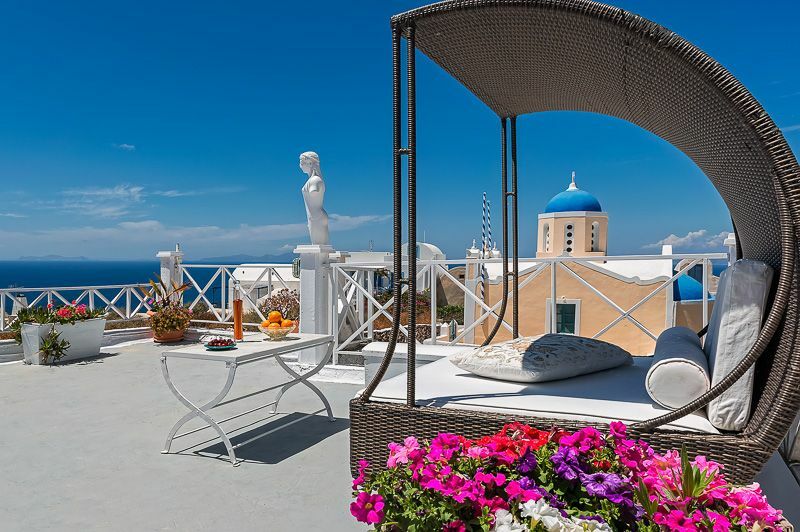 SantoriniParadise: SUNSET APARTMENT, panoramic sunset views from the terrace! SECLUDED HIDEAWAY IN THE HEART OF OIA! ENJOY OUR 'SUNSET TERRACE' cave house! This charming traditional cave house offers panoramic view to one of the most attractive sunsets in Greece. The romantic rooftop terrace and the yard are shared with SUNSET Studio cave house. It's perfect to sit out there with a glass of wine, a book and to watch the sunset. Its magnificent view to Oia's sunset, makes the multi level terrace of the house an ideal place for relaxation. PERFECT LOCATION FOR YOUR HOLIDAY! The cave house is in the heart of Oia. Very close to the center and away from all the hustle and bustle of the main street. 'SUNSET Terrace' cave house consists of two bedrooms with traditional style double beds and a living room with a large sofa bed. There is also a separate dining area, which includes a second traditional handmade sofa and a large table with a tray of welcoming fruits. There is a kitchenette. The bathroom features a shower. The rooftop and outdoor garden are very peaceful and beautiful. The location of “Sunset Terrace cave house” is suitable for our guests to reach the main places of interest of Oia in a minute! Oia, this beautiful village, carved into the ash of the volcano more than 1,500 years ago, will receive you in one of its original, traditional cave houses, the SUNSET TERRACE cave house. People here dug their houses underground or into the cliffs to be protected from the wind, the cold, the summer sun and especially the earthquakes! This kind of architecture makes the village a unique place on the planet! SUNSET TERRACE, because of its singularity, has to be preserved exactly as it was originally! In case you are more than 5 people and you need more bedrooms and a second bathroom, there is SUNSET STUDIO, a beautiful cave house with a double bed and a sitting area in the living room, a kitchenette and a bathroom with shower. It is just next door. PERFECT FOR YOUR FAMILY OR GROUP OF FRIENDS! The cave houses are recommend for one or two families or two groups of friends. If you want to get away to relax, write and just enjoy the life of Santorini without feeling like a tourist, SUNSET TERRACE is ideal. The house has Wi Fi and AC - although rarely needed as the house gets a nice breeze if you leave the windows open. The house is 20 meters from shops, restaurants and 2 minutes walking distance from market, galleries, bus and taxi terminal. It is located in the old city of Oia near the Castle which is the famous 'Sunset Point' of Greece! It is also 2 minutes' walking distance from the Lounge Cafe Pool Bar “Lyogerma” and 10 minutes' drive from the three beaches that are near Oia. There is a UNIQUE SUNSET View from the large terrace! 1) A welcome assortment of bottled mineral water, wine and juice upon arrival. 2) Breakfast provisions: honey, butter, marmalade, milk, fruits, eggs, wheat bread, cereals, 3 kinds of coffee and tea, cocktail of herbs. In the morning we may occasionally offer a tasty Greek delicacy for free. 4) Satellite TV, Wi-Fi in all areas and Air Conditioning. 5) The cave house is 2-3 minute walk from the Pool Bar “Lyogerma”. You can swim for free and it is open all day long (May-Oct). It has the best view to the Sunset! You will be offered a 15% discount for your drinks and snacks. 6) By showing our privilege card, you have discounts or free deserts to a few restaurants in Oia and other towns in Santorini! For example a) You will be offered a desert at the picturesque and tasty restaurant of Santorini "AMMOUDI restaurant" in the port of Ammoudi! Villa Facilities: Sea, Sunset view, Terrace, patio, Satellite Channels, Flatscreen TV, Air Conditioning, Living and Dining area, Kitchenette, Refrigerator, Electric kettle, Kitchenware, Oven, Toaster, Coffee machine, 1 Bathroom, indoor Shower, Free toiletries. We strive to provide top quality services to enhance our guests experience while they are visiting the island. There is a patio (40 meters) and a terrace (78 meters in total for both houses). You will certainly enjoy your breakfast or dinner at the large patio or the large terrace, 80 m², which overlooks the sunset, the volcano and the little islands of Old and New Kammeni to the west, the church of Saint Dimitrios to the north and the islands of Ios and Anafi to the east. affiliate company: LYOGERMA POOL BAR. -15% of to your food & drink order. The rate includes 1) A welcome assortment of bottled mineral water, wine and juice upon arrival. 2) Breakfast provisions: honey, butter, marmalade, milk, fruits, eggs, wheat bread, cereals, 3 kinds of coffee and tea, cocktail of herbs. 3) Daily maid service, change sheet, bath and beach towels every three days. 4) Satellite TV, Wi-Fi and Air Conditioning. 5) The cave house is 2-3 minute walk from the Pool Bar “Lyogerma”. You can swim for free and it is open all day long (May-Oct). It has the best view to the Sunset! You will be offered a 15% discount for your drinks and snacks. 6) By showing our card, you have discounts or free deserts to a few restaurants in Oia and other towns in Santorini! For example a) You will be offered free desert with your meal at the most picturesque and tasty restaurant of Santorini 'AMMOUDI restaurant' in the port of Ammoudi! We had our host help us choose a space to enjoy the Oia sunset and light breeze. We had a big enough space to have a private catered dinner for 4 and a dance area where two musicians played the night away. We had use of the bathroom and the chef had easy accessibility to the kitchen. It was perfectly decorated. A couple of lights allowed the night to magically glow. Spent the last night of our holiday in Santorini here. Internally was a little more spacious than the Blue & White cave house we had rented for the 5 days prior to this. Clean and well maintained with a fabulous roof terrace and hot tub. Located at the end corner of Oia. Outstanding customer service from Maria the owner and George who works for her. We stayed in Sunset Terrace 1 for our honeymoon, and could not have been more pleased. The house was beautiful- nicely decorated and very clean. The terrace was huge and had the best views of the sunset. The house was in the best location! It was not covered with tourists, but still close enough to all of the nice restaurants and bars. An extra bonus was having delicious breakfast served to us every morning and Maria provided special treats for us. Maria gave us all the info that we needed to find the place and was very helpful with giving advice of things to do and see around Oia. She recommended the most beautiful beach that was not covered by tourists. We highly recommend staying here! We stayed 2 couples in July 2012. Our best recommendations for this ultimate adorable house in the center of beautiful Oia – the best place to stay in all Santorini. The house is really nice and it has an amazing roof terrace with a stunning sunset view to white houses, churches and the Sea. The host Maria is very kind and provides you with a really nice and personal service. All in all – a stay at this house is a memorable experience! We just returned from a week staying at Sunset Terrace 1 (2 bedrooms, 1 bathroom) with our two young children aged 4 and 2 and we absolutely loved it! The house has been lovingly furnished and decorated by Maria. It is quite cosy and my 6'2" husband suffered a few head injuries due to the low-height doors, but this was completely overshadowed by the divine terrace. All the reviewers have raved about the beautiful, bougainvillea-drenched terrace. It's true. Santorini is not all about sunsets, but sipping a glass of Maria's homemade sherry on a terrace stretched out over the caldera while the sun sinks into the red and orange hued sea is undeniable bliss! The villa has one of the best views of the best sunset in Oia and we felt like royalty relaxing on the terrace whilst bus-loads of tourists crowd on the footpath just beneath us! One of the highlights of our stay was Maria's Sunday evening 'Sunset Party' for the guests of all her houses in Oia. The other families were delightful and we shared a great meal and wine prepared by Maria and Miranda. Our children loved it so much we had our own sunset parties thereafter including sunset pyjama parties, sunset breakfast parties, and sunset kids' dinner parties (Maria also organised babysitting for us on 2 nights). Maria is the consummate host and a wealth of knowledge on where to go, what to do and where to eat in Santorini. It was wonderful to have her local knowledge on tap! We look forward to returning one day. I was part of a group of four ladies that stayed together in April 2012 at Sunset Terrace. Three of us had been in Florence, Italy for 8 months studying art. The house was adorable and had everything we needed for our 6 days of relaxation. Our flight to Santorini from Athens was cancelled due to inclement weather and we had to rebook for the next morning, but Maria was more than accommodating. She provided us with everything we needed, and every morning we had a lovely homemade breakfast ready. We were very glad to have chosen Oia as our place to stay. The terrace looks out over an incredible sunset with nothing in the way, and it is a great place to hang out. The house is close to restaurants and shops but nice and quiet in April. I would go back to Sunset Terrace for sure, and send my relatives - I know they will be happy with Maria!